Ed Brantley and Bob Thomas go back a few years together. Both were disk jockeys before they teamed up for the popular Ed and Bob Talk Show on the radio. 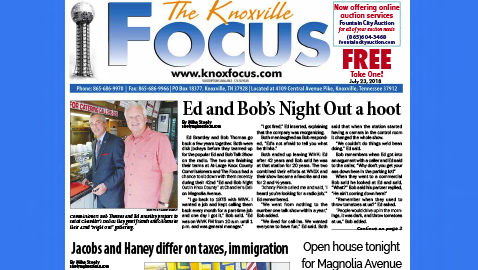 The two are finishing their terms at At-Large Knox County Commissioners and The Focus had a chance to sit down with them recently during their 42nd “Ed and Bob Night Out in Knox County” at Chandler’s Deli on Magnolia Avenue. “I got fired,” Ed inserted, explaining that the company was reorganizing. Both ended up leaving WIVK: Ed after 42 years and Bob said he was at that station for 20 years. The two combined their efforts at WNOX and their show became a favorite and ran for 2 and ½ years. “Johnny Pirkle called me and said, ’I heard you’re looking for a radio job,’” Ed remembered. ”We went from nothing to the number one talk show within a year,” Bob added. “We lived for call-ins. We wanted everyone to have fun,” Ed said. Both said that when the station started having a camera in the control room it changed the whole show. “We couldn’t do things we’d been doing,” Ed said. “Remember when they used to throw tomatoes at us?” Ed asked. “People would drive up in the mornings, it was dark, and throw tomatoes at us,” Bob added. “We used to pick different cities to have lunch in,” Ed said, adding, “But we didn’t go.” He said Bob would pick information about the town and they would talk about it on the show. The monthly Ed and Bob Night Out has been held in every part of the county for the past four years with the idea of getting out and meeting with citizens who cannot or do not attend commission meetings. Bob was the first to think of running for commission and called Ed and talked him into running. “I think we’ve stayed true with what we started with,” Bob said of their service on commission. “I never wanted to serve more than one term,” Ed said. Asked if they often vote the same on issues, Bob said they don’t because they cannot (by law) speak with each other about agenda items prior to meetings. “Ed says what he thinks and I admire that. Many times I wished I had more courage to do that. It’s a great quality,” Bob said. What’s in the pair’s future? “I’m on the Foster parents Review Board,” Ed said, indicating that will keep him busy. Ed recalled a favorite incident during their talk show days. He said a woman called who drove a handicapped bus to school and called in to ask the pair to sing their “Good Morning” song. She said the kids were refusing to get off the bus until the song was sung because they sang along every morning with Bob and Ed. “I don’t know why we started that song but it became a thing,” Bob said. “I’ll be honest with you, I’m surprised someone hasn’t put us on the radio,” Ed said. “Or on TV,” Bob added. “There’s not a talk show like ours at all now,” Bob said.